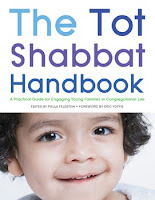 The Tot Shabbat Handbook: A Practical Guide for Engaging Young Families in Congregational Life (URJ Press) edited by Paula Feldstein, is book and CD resource for helping congregations create meaningful Shabbat programs for families with young children. Rachel Kamin, my friend and fellow Syndey Taylor Book Award Committee member, is one of the talented experts who shared her knowledge about successful Tot Shabbat programs. Rachel is also a member of the editorial board for the URJ Press. I’m thrilled that Rachel was able to chat with me about this very special project.Tell me about the TOT SHABBAT HANDBOOK and your contribution to the book. Who is the intended audience for the TOT SHABBAT HANDBOOK? Rabbis, educators, and lay leaders responsible for conducting Shabbat services for young children and their families will find the handbook most useful. There are also several chapters that synagogue, community center, and day school librarians will find interesting. Diane Person, a children's literature professor at Long Island University, authored the chapter, "Choosing a Wonderful Story" and Eva Grayzel, a performance artist specializing in Jewish folklore, wrote a chapter on "Interactive Storytelling Techniques." If parents have never been to a Tot Shabbat service how can they become involved? I think many congregations have Tot Shabbat programs that are led by parents, who will also find The Tot Shabbat Handbook very helpful. The chapter, "Never to Young to Pray" by Sue Ann Wasserman explains the importance of Tot Shabbat for young children. Award-winning recording artists, Peter & Ellen Allard write about Tot Shabbat as an opportunity to build a Jewish brain and nurture a Jewish heart. And, Rabbi Shawna Brynjegard-Bialik outlines the benefits of parent involvement in Tot Shabbat, how to recruit parents, and how to form and empower a parent committee.